You must pay your first month's premium before you are insured under Obamacare. Just because you've picked an Obamacare insurance policy doesn't mean you've got coverage. If you want to be insured come Jan. 1, you have to pay your first month's premium by your insurer's due date, often Dec. 31. Sounds simple enough, but federal officials and insurers are concerned that many consumers don't realize they have to take this last step and will remain uninsured. What's more, those who don't pay by then may have their Obamacare applications terminated, forcing them to re-enroll via healthcare.gov for coverage that will begin later in 2014. The tight deadline and continuing errors with consumers' applications being sent to insurers also risk leaving some folks uncovered. Obama administration officials are advising consumers to check with their insurer of choice to make sure it received their application and payment and that coverage will begin Jan. 1. Here's the timeline: Consumers have until Dec. 23 to pick an insurance plan on healthcare.gov, the federal Obamacare exchange handling enrollment for 36 states, if they want to be covered at the start of the new year. 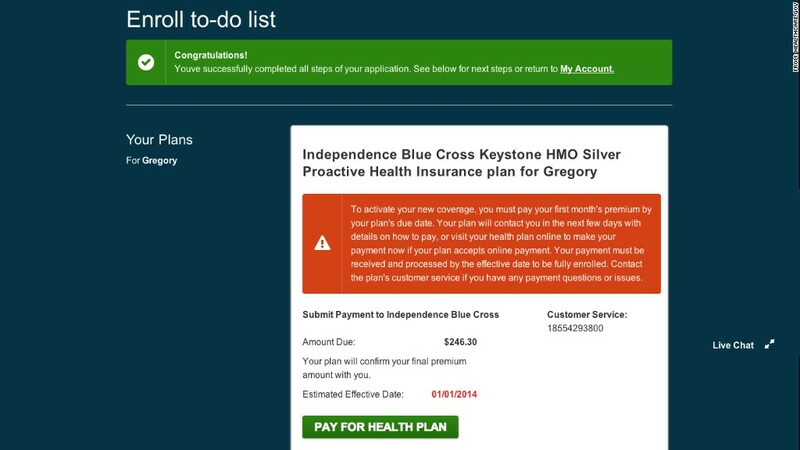 Once they do, a final screen confirms they've completed their application, but warns that they have to pay their first premium for coverage to be activated. The site then provides a payment button that takes them to their insurer's website. Some companies accept online payments, but others give consumers information about how to take care of the bill. Those who live in the 14 states (plus the District of Columbia) with their own exchanges face different deadlines. In Oregon, for instance, residents had to submit initial applications by Dec 4, while Californians have until Jan. 6 to make their first payment. Those planning to sign up this month should check the deadlines of both their exchange and their chosen insurer. While the Obama administration has reported that more than 100,000 Americans picked plans in October, the first month of open enrollment, it's not known how many of them have paid. One insurer, Physicians Health Plan of Northern Indiana, has received payments from only about 20% of applicants, nearly all using the firm's online portal, said Jim Brunnemer, the chief financial officer. It is sending invoices and email reminders to those who haven't yet sealed the deal. If payment isn't made by New Year's Eve, PHP has been told by federal officials that it must void the application. Another complication is that insurers also don't have a lot of time to process applications and send out ID cards. The timeline, particularly over the holiday week, will prove "challenging" for some companies, one industry executive said. It usually takes 10 days for Scott & White Health Plan to activate an applicant, said Allan Einboden, chief executive of the Texas-based insurer. But the company will work with new enrollees to make sure that their prescriptions and other medical needs are covered in the early days of the new year. "We have mechanisms to get people by," he said. The process is being further complicated by the fact that insurers are receiving applications from healthcare.gov that contain errors, such as missing data. Some applications aren't getting through, so insurers don't know to follow up with these folks. Both of these problems are slowing down the enrollment process. The issue is serious enough that federal officials are reaching out to applicants via phone and email to make sure they pay for a plan and contact their insurer to confirm enrollment. "We will also make a concerted effort to reach consumers who selected a plan over the course of these past several weeks so that they know what their next steps would be," said Julie Bataille, a spokeswoman for the Centers for Medicare & Medicaid Services, which is managing healthcare.gov. For those who miss gaining coverage starting Jan. 1, there's still time to sign up in 2014. Enrollment runs through March 31.